Short Version: As ergonomic mice go, Microsoft’s wireless offering provides plenty of relief from repetitive stress injuries without deviating too far from the familiar form factor found in standard mice. And with an MSRP of $80 (and available for even cheaper online), it’s priced competitively with other specialty mice. Anyone who’s had the displeasure of dealing with a computer-related repetitive stress injury will tell you that even the simplest of tasks (like moving a mouse around) can become excruciatingly painful. 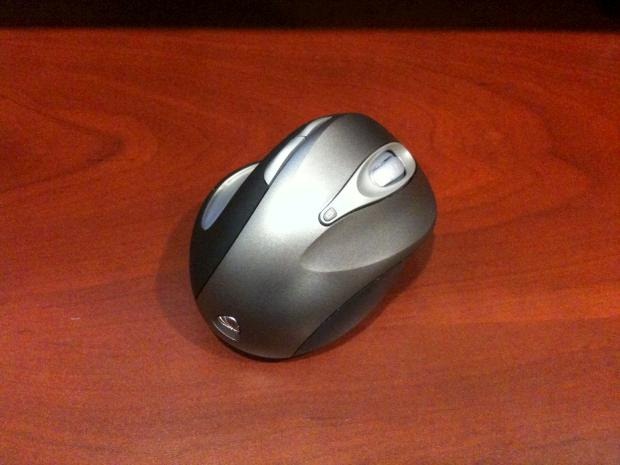 And while there are plenty of ergonomic mice on the market, they’re often expensive, oddly-shaped, or both. 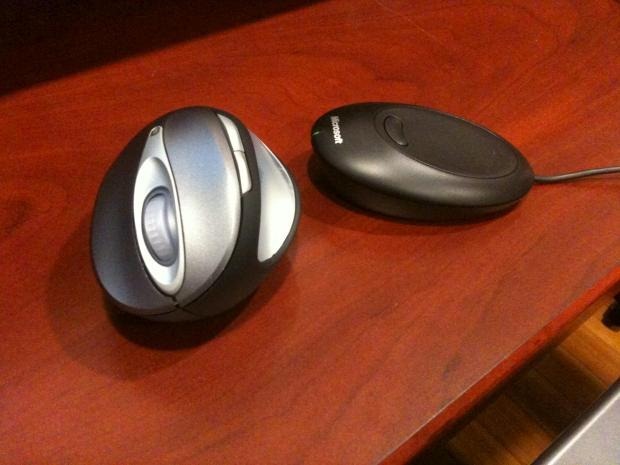 Microsoft’s take on the ergonomic mouse strikes a delicate balance between usability and relief. It’s a bit taller than an average mouse, and its sloped design forces your hand into a more natural “handshake” position which works wonders to relieve inflammation of the tendons running along the underside of your wrist. Since it’s laid out like a regular mouse, though, the learning curve is all but nonexistent. I was up and running in no time – much faster than with any of the trackballs or joystick-style ergonomic mice that I’ve tried in the past. The two main buttons make up most of the surface on the top of the mouse, which allows you to click with your entire index or middle fingers, and a large groove on the left hand side of the mouse provides a comfortable saddle for your thumb. The scroll wheel is downright amazing in that it simply rolls back and forth with no resistance whatsoever, almost as though it’s somehow lubricated. Wonderful though the scroll wheel may be, its actual placement makes it awkward to use as a third mouse button. I’ve historically used middle mice buttons to open new tabs in browser windows, but pressing the Microsoft mouse’s scroll wheel takes too much straining so I’ve been relegated to holding down the CTRL key on my keyboard instead. 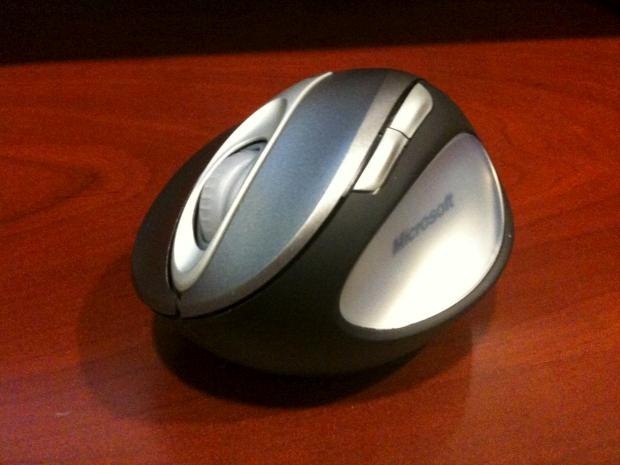 The wheel is positioned too far back on the mouse’s body to easily click downward with an index finger. The wireless mouse uses two standard AA batteries to communicate with a USB receiver. Battery life is rated at over six months (I haven’t had the mouse long enough to actually verify that claim yet), but the receiver needs to be placed within a few feet of the mouse in order to avoid intermittent signal drops. Thankfully, the USB cable attached to the receiver is nice and long, allowing you to position it nearby. There are also two programmable buttons located between the thumb and index finger, but they’re so hard to effectively manipulate that most users will likely forgo using them altogether. They’re just out of thumb’s reach and placed too far back to be clicked by the index finger quickly enough to make the effort worthwhile. Aside from those few minor quibbles, though, the actual experience of using the mouse for straightforward tasks is outstanding. After just a single day your wrist will feel much better and by the end of the first week, you’ll likely notice that the pain has gone away completely.